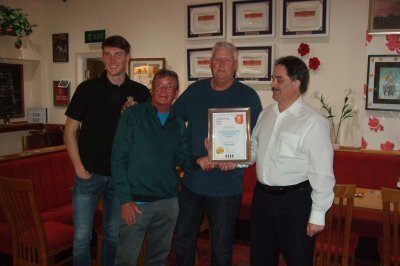 On Wednesday 9 May we presented Ken Bailey (Steward), Mike Kearns (Secretary) and James E Cropper (Bar staff) of The Royal British Legion, Boothstown, with our Club of the year award for 2018. The Royal British Legion, which opened in 1947, has been turned around from nearly being closed ten years ago, to a welcoming, cosy club with various rooms, two snooker tables, dart boards, a lovely outside area and even a gin bar! 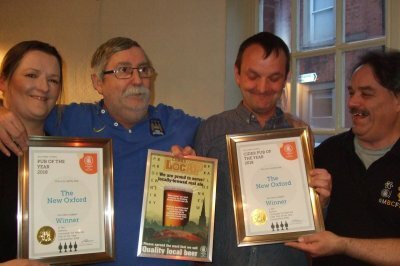 The club hosts a beer festival on the weekend following remembrance Sunday. The Branch Diary has been updated to include socials up to the end of July 2018. The Moorings, Boothstown has reopened after refurbishment. Please see their website or visit their facebook page for full details. Please note that the dates for the following have been swapped round. Monton Crawl originally planned for 09/05/18 will now take place 25/04/18. Club of the year presentation to Boothstown Royal British Legion originally planned for 25/04/18 will now take place 09/05/18.